Four weeks ago, we reviewed how the Saints measured up in a variety of statistical categories. Now after 8 games and a larger sample size, let's take a look and see how the Saints rank in several areas. Also, we'll take a comprehensive peek at every player's performance and see how it ranks league-wide, both by the traditional statistical rankings and by the advanced metrics available to us. For the team rankings, I'll be mostly using the same categories I used after week four. A green arrow indicates that the Saints have moved up in ranking (not raw statistical output) and a red arrow indicates that the Saints rank worse in the respective area than they did four weeks ago. Not exactly rocket science here, but I figured I'd explain anyway. Once again, there are a lot of stats to come. The most important notation here: over the past four games, the Saints have improved their offensive red zone efficiency by 13%, moving them from 20th in the league after four weeks to 11th after eight weeks. This is not only a decided improvement, but it's a crucial area that demands high efficiency week in and week out. I'll be interested to see if the Saints continue to improve here. 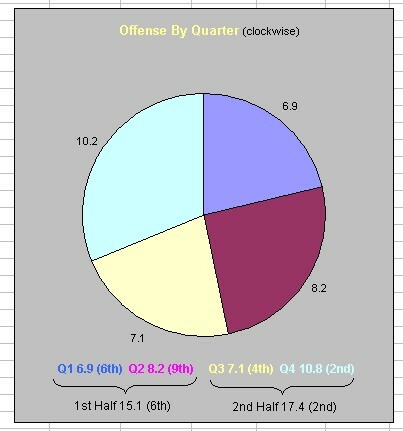 Time of possession, another stat we reviewed four weeks ago, remains largely unchanged. The Saints rank 5th in time possession at 32:33 per game, improving one spot since week four. The Saints are down across the board in rushing offense, but not dramatically so. Also, the offense continues to call running plays at the same proportion they have since week four, at about 37% of plays. This rush-play percentage ranks 29th in the league. It's no real surprise that the Saints have the top passing offense in the league. Although the Saints are averaging about 9 fewer passing yards per game than they were after week four, they have nonetheless moved into the top spot. Also, the Saints have gotten a bit worse at protecting Brees. Their sacks allowed/game have jumped from 2.2 to 2.4 and, more importantly, their sack rate--a more precise benchmark that measures the rate of sacks per pass attempts--has risen from 4.9% to 5.25%. This ranks 9th in the league, so the Saints are still doing a good job in this category (save for the Rams game). There's good news and there's bad news here. The Saints are allowing the third-fewest red zone scoring attempts per game at 2.4 (which is just a shade off league leaders Baltimore and Cincinnati at 2.3). That's the good news. The bad news is that the Saints are the stone-worst in the league in opponent's red zone scoring percentage, which measures how often opponents score touchdowns once they enter the Saints red zone. The 74% clip is both abysmal and shocking, and it's a significant 8% worse than the 31st-ranked team (Philly). There's hope though. If the Saints' defense can continue to limit red zone opportunities while moving their red zone percentage closer to the league average of 52%, the defense could improve demonstrably in the second half of the season. The rush defense--the dead horse that's been continually beat these past few weeks--has gotten substantially worse since week four. The defense has allowed 100+ yards in 7 of 8 games thus far. In the one game they didn't surrender 100 yards rushing--against Chicago--they allowed Matt Forte to catch 10 passes for 117 yards; many of these receptions were via screen pass, which essentially function as running plays in the Bears' offense. A year ago, the Saints allowed 100+ yards rushing in just 7 of 16 games, a figure they've ignominiously matched already this year. The silver lining here is that the Saints are playing well against the pass. In today's NFL, this is the more important area to excel in, yet the net benefit is negated when the Saints' defense is allowing almost as many yards via run (5.5) as they are via pass (6.1). From here on out, I'm going to realllllllly dork it up. You've been forewarned. Instead of highlighting individual players who have performed well through midseason, I decided to look at all of the Saints players on both offense and defense. Specifically, I charted where each player ranks league-wide in a host of categories. Each of the numbers in all of the charts below indicate the league-wide ranking in the applicable category. These first charts are based off of the the traditional statistical benchmarks you're familiar with. Numbers in red, obviously, indicate a top-ten ranking in the associated category. "DNQ" means "did not qualify;" this relates to minimum accepted attempts as defined by the NFL. The Saints' individual defenders rate as such. Again, numbers are league ranks. 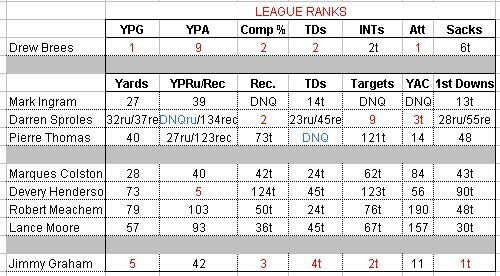 * Aside from Devery Henderson ranking 5th in yards per catch (19.1), the remainder of the Saints' WRs have been quiet through eight games. * Three players--Sproles, Graham, and Thomas--rank in the top 15 in yards after the catch. * Brees' 10 INTs through 8 games are one off the league "lead." * Sed Ellis has more passes defended than Tracy Porter, Roman Harper, and all of the LBs. 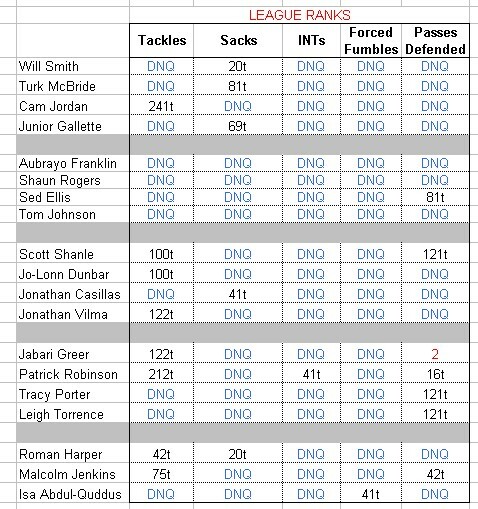 * Of the Saints' eight defensive lineman, only one (Jordan) ranks in the top-250 in tackles and he ranks 241st. Now let's look at some advanced stats, and how each player ranks in the various categories. Beneath each table are links to full definitions and explanations for each statistical category. QBR - quarterback rating; DYAR - defense-adjusted yards above replacement; WPA/G - win probability added per game; EPA/P - expected points added per play. ALY - adjusted line yards; Pass Pro - pass protection; WPA - win probability added; EPA - expected points added. 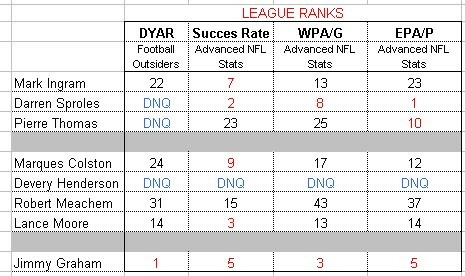 DYAR - defense-adjusted yards above replacement; Success Rate; WPA/G - win probability added per game; EPA/G - expected points added/play. +WPA - win probability added per game (defense-specific); +EPA/G - expected points added per game (defense-specific); Success Count; Tackle Factor. * The Saints are the only team in the league with two RBs in the top-10 in "success rate:" Sproles at 2, Ingram at 7. 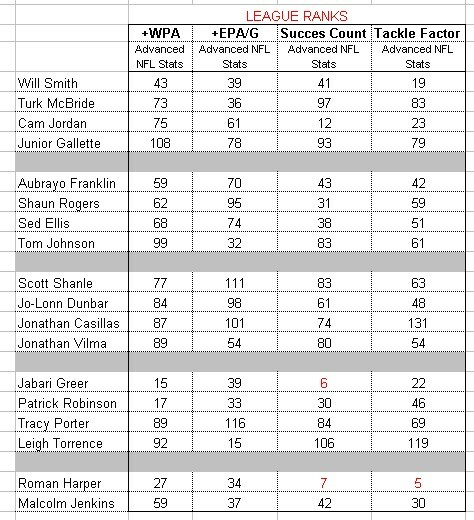 They're also the only team with two RBs in the top-10 in EPA/P: Sproles at 1, Thomas at 10. * The offensive line, probably contrary to current popular opinion, still rates as one of the better units in the league. I'm most interested in watching these ratings as the season continues. 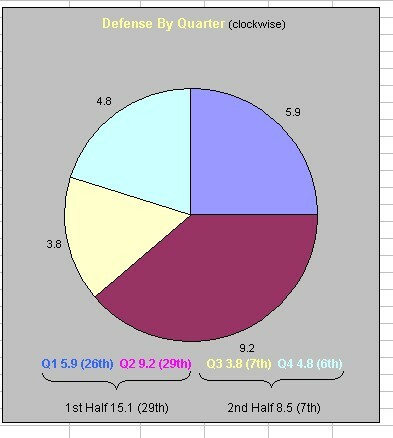 * The defensive line has been mediocre, bordering on poor. Cam Jordan is the only player with a top-15 rating in any advanced statistical category (12th, success count). * By all appearances, the Saints probably have the worst-performing LBs in the league. * The Saints' best defenders have been Jabari Greer, Roman Harper, and Patrick Robinson. OK loyal followers, that's all for now. I hope you enjoyed this. After week 12, we'll take another look and see how things have progressed (or devolved).